Not happy with the progress of a project and want to keep an eye on things remotely? I am the type of guy that likes to know how things are progressing on a regular basis and after making the 24+ hour journey from Sweden to Australia to check on the status of my house only to find out that the project was a little more than two months delayed - it was time to put my IoT and programming skills to use. I decided to setup a remote monitoring system. I found a cool project on the learn.adafruit.com where a user posted a how-to for building a security solution using an Arduino Yún, a USB web camera and a PIR motion detector - the perfect find for a base point of what I would need to make this project work. I identified a local distributor of Arduino devices in Perth, Western Australia - specifically Altronics and after dropping by a store I found out they only just got the Arduino Yún in stock to compliment their limited supply in addition to having all the little bits and pieces I needed. The two main obstacles is the lack of a power source and the lack of an Internet connection to send the sensory information gathered to a web server where I can monitor the progress. The cost of all the equipment is approx $1000 USD; luckily I already had most of the components. 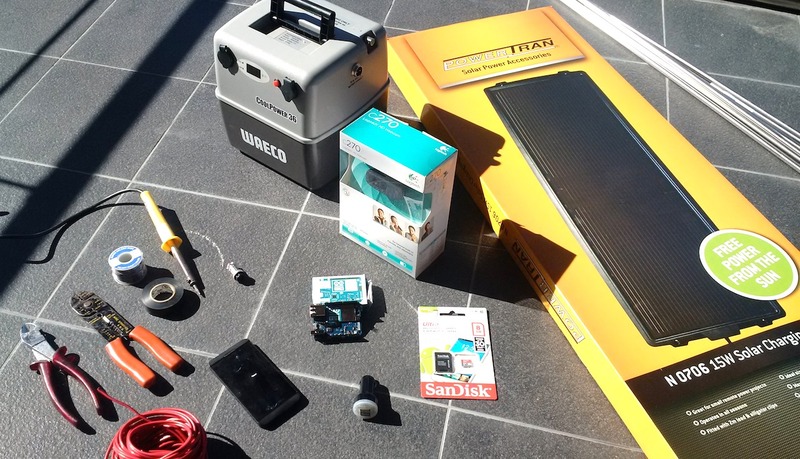 Supplying power is easy - I had a 12V battery lying around and the only thing I needed to obtain was a decent sized solar panel to keep it topped up and a car-adapter to USB plug to power the two devices I will be using; I also needed to get some extra wire and adapters. For an Internet connection I could have asked the neighbours to see if I could piggy back on their connections but I want to do this in stealth mode so I figured I could use a spare BlackBerry Z10 I had lying around and configure it as a mobile hot spot to connect through. I will post a follow up blog entry that goes into detail of how I put it all together, outline the specific scripts written and even expose a live website so anyone can check on the progress of my house - I may even connect some sensors to monitor other factors if there is interest.